As always I begin with optimism when another metal platter defined as melodic thrash, death metal, or metalcore crosses my desk. Invariably, I'm never surprised or overly impressed by what I hear. Call me an eternal skeptic, but most modern metal in this vein is overtly redundant and hardly novel. With Constructdead's Endless Echo my cynicism remains. Except for the fact that Constructdead performs their music with skill and enthusiasm, Endless Echo does little to raise the bar for modern metal. This is not to say that I didn't enjoy some aspects of Endless Echo. No, when Constructdead merges their anxious and brutal thrash movements with melodic turns and interludes, as on A Goddess Breaches Through Me or Disfigured Beauty, things get quite interesting. Otherwise, Endless Echo is merely more of the same harsh, thrashy metal with annoying, please-shoot-me-now screamo vocals, blast beats, and breakdowns. Actually, it's the breakdowns filled with melody, harmonious vocals, or ripping (but often short) guitar solos that makes Constructdead and Endless Echo a charming and guilty pleasure. 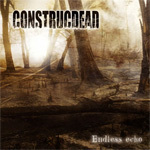 However, since Endless Echo is only reconstructed conventions, Constructdead is dangerously close to becoming like their peers: familiar and commonplace like a MacDonald's restaurant in every town. Ultimately, though Sweden's Constructdead may be at their best here, and most likely quite better than their peers, Endless Echo is merely another trivial example of modern metal trends with some momentary highpoints. Though Sweden's Constructdead may be at their best here, and most likely quite better than their peers, Endless Echo is merely another trivial example of modern metal trends with some momentary highpoints.